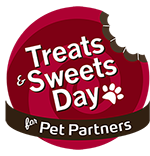 What is Treats & Sweets Day for Pet Partners? Treats & Sweets Day is the yummiest fundraising event of the year to raise funds in support of Pet Partners. For Treats & Sweets Day, bakers from across the United States will invite their friends and family to support Pet Partners by making donations and attending Treats & Sweets Day parties and bake sales. The donations raised will help to honor and support therapy animals, and will enhance the lives of the over three million people who benefit from Pet Partners therapy animal visits each year. By setting up an individual fundraising page, or Online Bakery, you will be able to efficiently spread the word to friends and family about your Treats & Sweets Day event, manage your fundraising, and raise vital awareness about the role therapy animals play in enhancing the health and well-being of humans. When do I need to conduct my Treats & Sweets Day event? Many people will choose to host their sale on April 30th in celebration of National Therapy Animal Day™, but you can pick any day during the month of April that works for you and your sweet-toothed customers. While the official campaign period of Treats & Sweets Day is during the month of April, we will support bakers who choose a different time of year. For example, some bakers may choose to host a holiday bake sale. Please email us at treatsandsweetsday@petpartners.org to let us know of your plans so we can make sure you have the resources you need. Is this a bake sale fundraiser for humans, or animals, or both? Treats & Sweets Day is a chance to bake and sell human treats, animal treats or both! Some folks may spend time baking healthy pet treats to package and sell, some will put all their efforts towards creating delicious people pleasing snacks, and some will bake both. Make Treats & Sweets Day your own special celebration of therapy animals and the humans they help! How will the funds I raise for Pet Partners be used? As a 501(c)(3) nonprofit organization, Pet Partners relies on donations from individuals, companies and foundations in order to support our life-changing work. The funds you raise through Treats & Sweets Day will be put to work to improve people's lives through the help of our animal companions. Pet Partners is the national nonprofit leader in demonstrating and promoting positive human-animal therapy, activities and interactions. Pet Partners has thousands of registered therapy animal teams who make visits across the United States. Pet Partners trains and evaluates teams across the nation so they may safely and responsibly visit with a variety of people including veterans, seniors living with Alzheimer’s, patients in recovery, students facing literacy challenges, people with intellectual or physical disabilities, and those approaching end of life. The impact of these visits is felt over three million times a year. How do I send in my donations? Most donations will be made online to your personal bakery. If your donors would prefer to pay by cash or check, their donations can be mailed to Pet Partners with an accompanying donation form. Please be sure to include a form for each donor so their contribution is tax deductible! Help, I lost my donation tax receipt! Not to fear, we can reissue one for you! Please contact treatsandsweetsday@petpartners.org for assistance.